Animal products are important because more than half of the world’s crops are used to feed animals, not people. Land and water use, pollution with nitrogen and phosphorus, and GHG emissions from land use and fossil fuel use cause substantial environmental impacts. The Amazon Rainforest is being cleared to provide grazing land for cattle. This is grass fed cattle folks. For all you who think that just because cattle is grass fed it is sustainable..think again. Just the land and water use for raising cattle make it unsustainable no matter how it is raised. Macca’s Meatless Monday/Meatless Advocates is a solution oriented activist group, with solutions for some of the most pressing issues of our time including: climate change, global food/water insecurity and public health. Here we don’t just talk about the severity of the crisis. Armed with knowledge about how our actions can contribute we become part of the solution. I was inspired to create this series by former Beatle and vegetarian advocate Paul McCartney (Macca) who partnered with the Meatless Monday campaign to promote less consumption of meat. We not only discuss the many advantages of a less meat diet we also do some cooking, share recipes and listen to great Beatle/McCartney music! 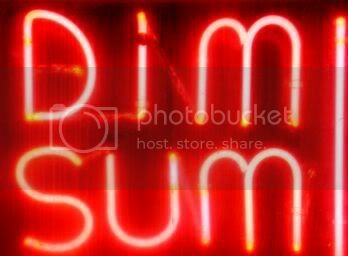 Arriving in a new city tired and hungry the most welcoming sight imaginable is a sign that says Open..Dim Sum. It awakens the senses to think of the smells, tastes, quiet activity and low conversations that will envelope you in comforting bliss. You don’t need to leave town to enjoy some great Dim Sum. You can prepare a substantial and delicious Dim Sum feast for just two or for more guests and you can even make it meatless for a delicious, eco-friendly party! For me, a must have Dim Sum addition. Place 2 Tbsp. oil in a wok or large frying pan over medium to high heat. Add garlic, galangal (or ginger), shallots, and chilli. Stir-fry until fragrant (about 1 minute). Stir-frying Tip: Add a little water to the wok/pan when it gets too dry instead of more oil. Add cabbage, mushrooms, and tofu . As you stir-fry, add the sauce. Stir-fry 1-2 minutes, until vegetables have softened. Remove from heat and add bean sprouts, tossing to mix in. Do a taste test for salt, adding 1 Tbsp. more soy sauce if not salty enough. To assemble rolls, place a spring roll wrapper on a clean working surface. Place one heaping Tbsp. of the filling on the wrapper (if using large wrappers, you will need more). Tips: Spread the filling lengthwise along the spring roll wrapper nearer the end closest to you. Also, try not to include too much of the liquid left in the bottom of your wok/pan (a slotted spoon works well for this – drier filling is better. Now sprinkle some of the fresh coriander and basil over the filling. Fold the left and right sides of wrapper over filling, then lift up the wide end nearest you and tuck overtop. Roll to the other end. Secure the roll by dipping your fingers in some water and wetting the end, “pasting” it shut. To fry spring rolls, place some oil (about 1 inch deep) in a wok or deep-sided frying pan over medium-high heat. When bubbles rise, or when the oil begins to form snake-like lines across the bottom of the pan, the oil may be hot enough. To test it, dip one corner of a spring roll into the oil. If it begins to sizzle and cook, the oil is ready. If not, wait another 30 seconds to one minute and try again. Using tongs, place spring rolls in oil, allowing them to fry about 1 minute on each side. Spring rolls are done when they turn light to medium golden-brown . Place on paper towels (or a clean dish towel) to drain while you finish frying the rest. Serve spring rolls while still hot with Thai Sweet Chili Sauce, or your own dipping sauce (see recipe above). ENJOY! TO MAKE YOUR OWN DIPPING SAUCE: Mix 1/3 cup plum sauce with 3 Tbsp. soy sauce. Add fresh cut red chili or dried crushed chili as desired. NOTE FOR BAKED SPRING ROLLS place in preheated 375F oven on lightly oiled pan for about 20 minutes, keep checking they just need to be light brown. I will let you in on one of my Dim Sum secrets. 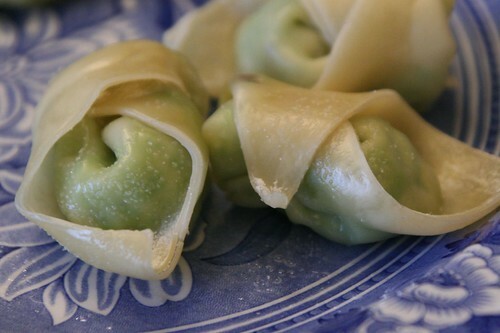 You can buy many great frozen vegetarian dim sum treats(even my generic market has them) and steam them at home. The bamboo steamers are inexpensive and make a beautiful serving dish if you’re just having a few people. You can then serve them with an assortment of homemade sauces…some here from Vegetarian Times and augment with some other homemade dishes. Whisk together vinegar, sugar, and soy sauce in small bowl; set aside. and cook 30 seconds, or until fragrant. Add onion, and cook 4 minutes, or until softened. 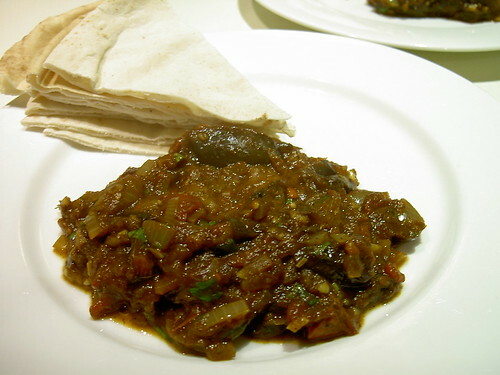 Stir in eggplant, and cook 2 to 3 minutes, or until browned and softened. Stir in vinegar mixture. Remove from heat, and serve sprinkled with cilantro. special equipment: bamboo steamer or other steamer or you may fry with enough olive oil to cover pan and turn as first side is browned. Bring a medium saucepan of water to a boil. Salt the water (as you would pasta water) and add the peas. Cook until bright green in color and puffy, about a minute if the peas were frozen, less if you started with fresh ones. Drain the peas and run under cold water for one minute to stop the cooking. With a food processor (or hand blender) blend the peas, ricotta cheese, olive oil, and salt into a puree. Leave some texture, don’t go too far . Return the mixture to a big bowl and stir in the shallots, Parmesan, and lemon zest. Taste. Add more salt if needed. 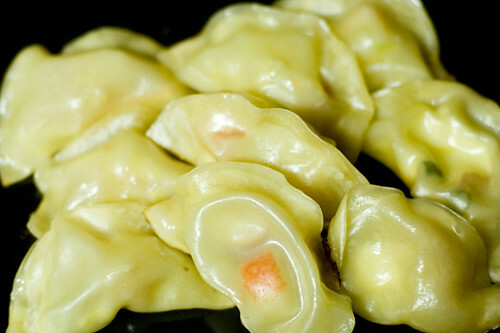 Fill the dumplings using an assembly line technique – a dozen at a time (for the most part following the instructions on the wrapper packaging). Place twelve wrappers out on the counter, drop a very scant teaspoon of filling onto each wrapper, rub the perimeter of each wrapper with a wet finger seal, fold (most packages have diagrams), and set aside on a plate. Do the next dozen and repeat until all the filling is used up. 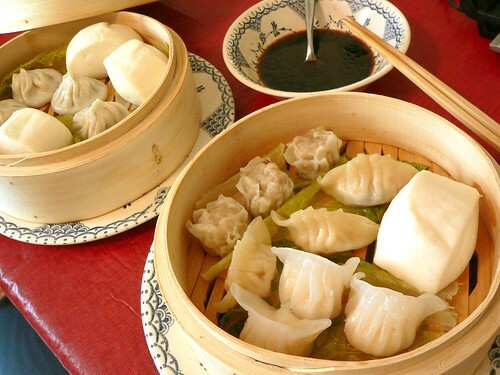 Set up your steamer, rub each dumpling with a bit of olive oil, arrange the dumplings in a single layer (being careful not to overlap), and steam for about three minutes – until the dumplings are tender and transluscent. Sprinkle with a touch of salt and enjoy. 1. In a medium bowl, mix flour, eggs and oil with 1 1/2 cups water until a smooth batter is formed. Stir scallion greens, chives, carrots and squash into batter. 2. Place an 8- inch nonstick skillet over medium-high heat, then coat bottom with oil. Ladle in about a quarter of the batter and spread it out evenly into a circle; if first pancake is too thick to spread easily, add a little water to batter for remaining pancakes. Turn heat to medium and cook until bottom is browned, about 3 minutes, then flip and cook for another 2 minutes. Repeat with remaining batter. 3. As pancakes finish, remove them, and, if necessary, drain on paper towels. In a small bowl, mix together the vinegar, soy sauce and sugar. 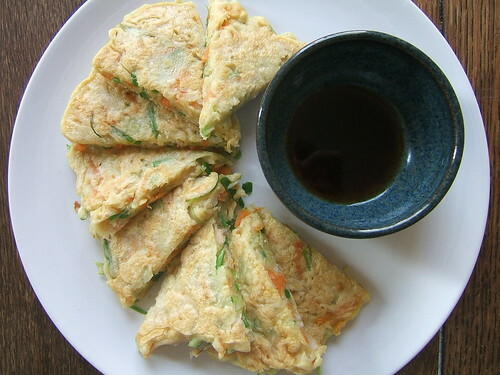 Cut pancakes into small triangles and serve with dipping sauce. Heat the olive oil in a large, heavy saucepan over medium heat, then add the onion, shallots, garlic, and salt. Saute, stirring constantly, for about 4 minutes, or until the onion begins to soften a bit. Add the barley to the pot and stir until coated with a nice sheen, then add the wine, and simmer for 3 or 4 minutes, until the barley has absorbed the liquid a bit. Adjust the heat to maintain a gentle, active simmer. In increments, add about 6 cups of water (or broth), 1 cup at a time, letting the barley absorb most of the liquid between additions. This should take around 40 minutes altogether – sometimes I only end up using 4 or 5 cups of water, it really depends. Stir regularly because you don’t want the grains on the bottom to scorch. You will know when the barley is cooked because it won’t offer up much resistance when chewing (it will be chewier than Arborio rice though). Don’t worry if there is a bit of unabsorbed liquid in the pot . When the barley is tender remove from heat and stir in the lemon zest, mascarpone cheese, most of the Parmesan and tofu if using. Then stir in the seaweed, and lastly the chopped spinach. Taste and adjust the seasoning if needed, adding a bit of lemon juice too if needed. Serve topped with walnuts and the remaining Parmesan. 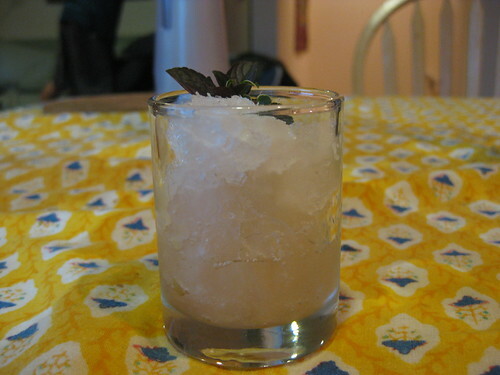 1/4 cup fresh mint (or use one tablespoon of sliced fresh ginger…incredible with asian food. 1. Bring 3 cups water almost to a boil. Add the tea and mint or ginger, cover, and turn off the heat. Let steep for 10 minutes, then strain to remove the solids. Stir in the honey and lemon juice. Taste and add more honey if necessary to make a nicely sweet blend. 2. Pour the mixture into a shallow glass or ceramic pan and freeze for at least 2 hours, stirring to break up the crystals every 30 minutes or so. It should be slushy and crunchy with ice crystals. If the granita becomes too hard, pulse it (do not puree) in a food processor before serving, or set it in the fridge for a bit and stir once in a while to bring back the desired texture. “I’ll Follow The Sun” Paul McCartney…this lovely song written by Paul when he was 15! What have you all been cooking? Please share your recipes and fave Beatle/McCartney music here! June 13th, 2011 | Category: Carbon Footprint, Climate Change, Community, Eco Tips, Health, Recipes, Those Doin' It!